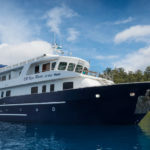 The Sea Safari 6 Liveaboard is a luxury Phinisi vessel, scheduling year round trips to the impressive dive sites of Indonesia, including Raja Ampat, Komodo, Maumere, Lembeh, Wakatobi, Ambon, Ternate, and the Forgotten Islands. 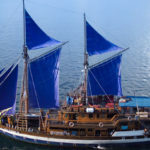 Having had her maiden voyage on Nov 8, 2015, M/V Samambaia is the newest two-mast wooden Phinisi schooner to sail some of the most gorgeous diving areas of Indonesia. Climb aboard into sheer luxury and unparalleled comfort: our focus is the utter satisfaction of our guests. Reflagged & renamed (formerly MV White Manta) to Indonesia (Aug-2016) keeping the main core of crew from the Black Manta recently sold. She has continued to WOW so many of our new and repeat guests with her thoughtfully decorated cabins, stylish finish, attention to detail, and more space & comfort all around. With trips to Thailand, Malaysia, & Indonesia under belt since her launch in Apr-2011 she be a firm favorite now relocated to Indonesia. 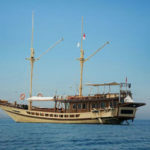 Plataran Phinisi Felicia is the largest in the fleet with two master cabins, two double cabins, and two bunk bed cabins, offering unsurpassed luxury and space to laze while touring the islands and bays of Indonesia’s hottest destination, including Komodo islands and the areas surrounding Flores. Plataran Phinisi Ambasi has three luxurious double cabins and one twin cabin for an incredible liveaboard sailing experience. 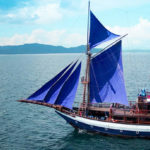 Fully renovated in 2016, The SMY Oceanic offers year-round liveaboard dive trips to Indonesia, visiting Komodo & Rinca National Park, the Flores & Alor Straits and the Forgotten Islands, fast becoming the new dive mecca in Indonesia. The guides and crew of the SMY Oceanic have more than 16 years’ experience in the region, and aim to show you the best of the area. At 40-meters, Ocean Pure is a privately owned, five cabin phinisi for enjoying a convivial lifestyle on the water. The bohemian chic interiors create the ambiance of a designer home for exploring the breadth and depths of Indonesia’s vast archipelago. 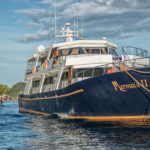 M/V Mermaid II is a 33 meters, double engine steel motor yacht. 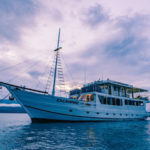 One of the most comfortable diver boats in Asia, she easily accommodates 18 guests in 8 deluxe cabins and 2 guests in a budget cabin below deck. All deluxe cabins are on the main deck with large panoramic sea view windows.